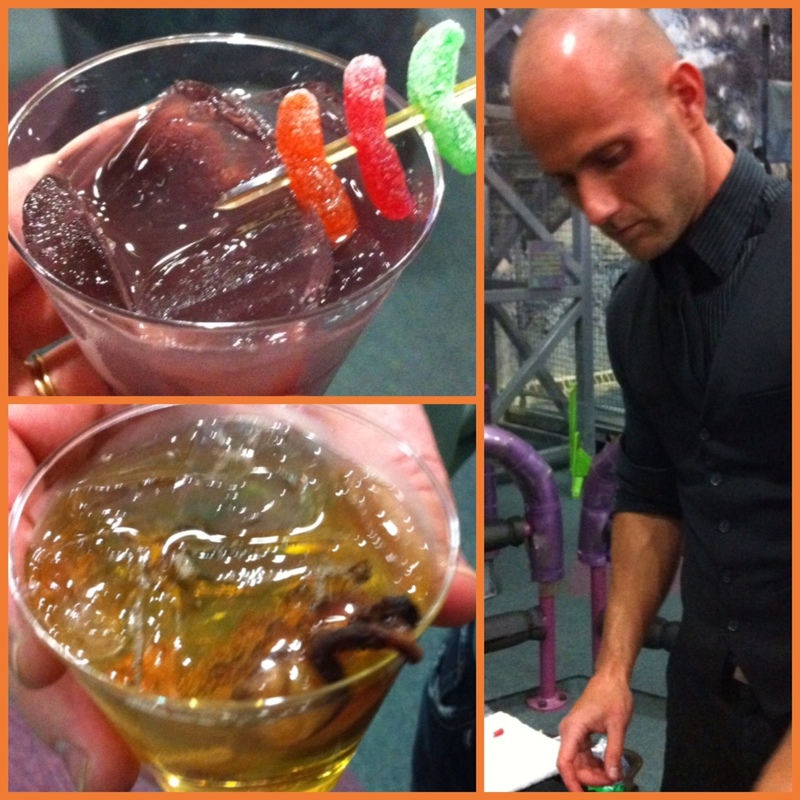 For the 2nd year, Jon and I attended Science Central’s annual fundraiser, Mixology, and thoroughly enjoyed ourselves. The food, the drinks, the atmosphere, and the friends make this one of my favorite fundraisers of the year. This year’s highlights include chatting with all 3 mixologists, Arthur Black, Bobby “G” Gleason, and Tim Atz, and sampling their creations. I especially liked Tim’s Halloween Night, made with raspberry schnapps, Blue Curacao, sweet & sour mix, and a splash of orange juice, garnished with 3 Sour Patch Kids. It was like drinking a Sweet Tart. So yummy! Jon was wowed by Tim’s Baconstein Monster, made with premium hardwood smoked bacon, Maker’s Mark Bourbon, and ginger ale, garnished with maple bacon. I mean really, how can you go wrong with bacon? 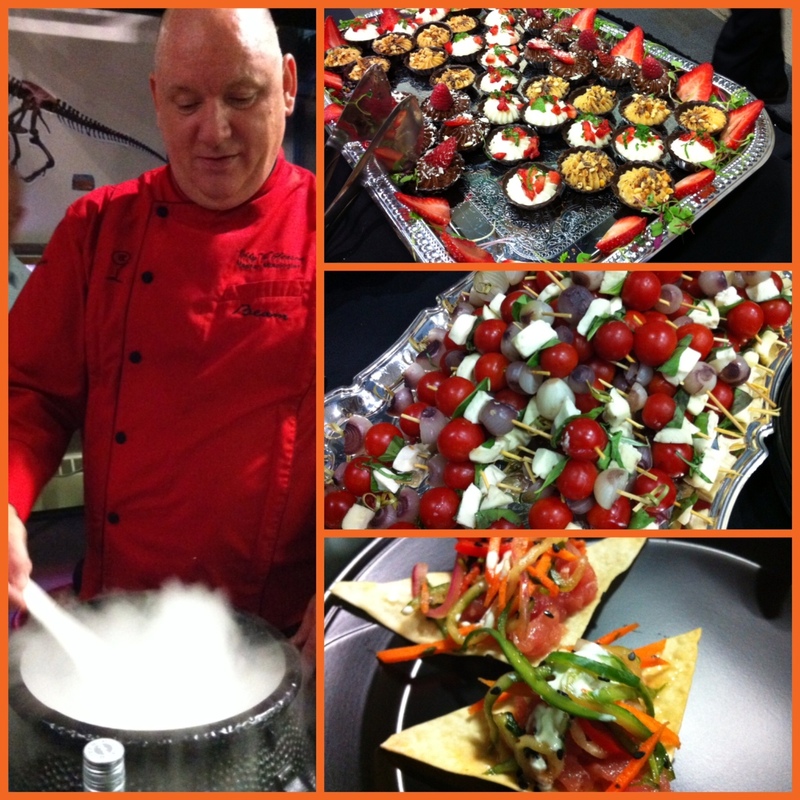 This year, the food was prepared by Baker Street, and my top picks include the Ahi Tuna nachos and Endive stuffed with Dos Equis grazed chorizo and Manchego cheese. The dessert table was out of this world and featured Chambord Sherbet with cracked espresso bean and caramel tuille, Pumpkin ale ice cream in a cinnamon-spiced white chocolate cup, and Grand Marnier-infused dark chocolate truffle with toasted almond dust and sea salt. We were a bit surprised by the layout of this year’s event. Last year, the food was centrally located, which made it easy to find, but also created a bottleneck. This year, the food was scattered throughout the event, which annoyed me at first, but pleased me as the event progressed because there were no lines to stand in. Because of the new layout, we ran across the dessert first- a minor inconvenience for traditional diners, but not for us! It guaranteed we had plenty of room to try them all. Just like last year, Ivy Tech’s culinary program was on-hand with some food demonstrations. This year, they really impressed us, not with the science, but with the results! 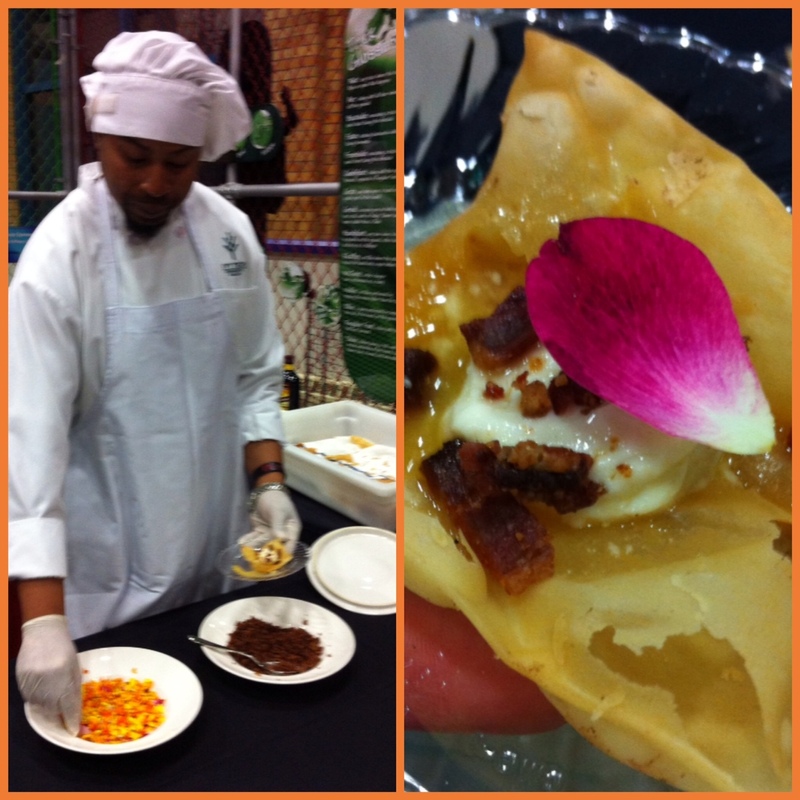 Truly mouthwatering culinary creations, including Hot Maple Ice Cream on bacon dusted Elephant Ears. Holy goodness! I’ve been continually impressed with the students and faculty of this program. I’ve had the pleasure of enjoying meals they’ve prepared on 4 occasions now, and they are always second-to-none. I urge you to check out their ethnic dinners, which will resume after the first of the year.